In demand flautist Emma Halnan first came to prominence as the woodwind category winner of BBC Young Musician 2010. She has since appeared at major venues worldwide, and has performed concertos with orchestras including the London Mozart Players, the European Union Chamber Orchestra, and the BBC Concert Orchestra. Other competition successes include the Sussex Prize for Woodwind in the Royal Overseas League Competition 2019, and first prize in the Sir Karl Jenkins/Arts Club Classical Music Award 2016. Emma has also been selected as a “Making Music” Philip & Dorothy Green Young Artist 2018-20. 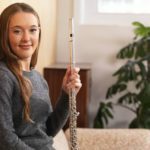 Emma was principal flute of the European Union Youth Orchestra 2014-16. She has also performed as guest principal of the BBC Scottish Symphony Orchestra, and guest principal piccolo of English National Opera. In recital, Emma has worked with pianist Daniel King Smith since 2008. Together, they have performed at venues including St. David’s Hall (Cardiff), Gower Festival, St. Martin-in-the-Fields and the “La Côte” International Flute Festival 2016 (Switzerland). Emma also works regularly with harpist Heather Wrighton and violist Jordan Sian (the Aurora Trio); they held a prestigious Chamber Music Fellowship at the Royal Academy of Music for 2014-16. Emma is also a highly reputed and very dedicated teacher, her pupils having gained places in the National Children’s Orchestra, National Children’s Wind Orchestra and at Junior Trinity. Emma has taught students at Cambridge University and King’s College London, and given numerous masterclasses, most recently at Trinity Laban Conservatoire. She also adjudicated the Final of the 2018 Trinity Laban Woodwind Competition. Emma studied at the Royal Academy of Music with William Bennett and Kate Hill, and afterwards with Robert Winn. She previously studied at the Purcell School with Anna Pope, where she won the 2010 Fenton Leavers’ Award. She has been generously supported by the Hattori Foundation and the Martin Musical Scholarship Fund. Emma also won the 2014 Kenneth Loveland Gift, and is a City Music Foundation Artist. "Emma is an astonishing musician and is able to transfer her talent to her students making her an excellent teacher. She offers sensitive guidance with honest feedback that ensures each lesson is tailored to our daughter's needs. The lesson is rounded so that knowledge and understanding of each piece is gained, helping our daughter to develop her own thoughts and interpretation of the pieces. She is an inspiring role model who encourages and challenges our daughter."